Note that each has a thumb screw on the side of the gallery (the picket-fence-like apparatus). That thumbscrew, when tighted down, secured the chimney in place. This was was handy for two reasons: (1) one could tilt or raise the burner to trim the wick without having to remove the chimney, and (2) it prevented the chimney from toppling when the lamp was picked up and carried around the house or out to the privy or the barn. 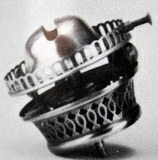 Some coronet burners were made with a single upright leaf spring that snaps into place in the indented chimney base to secure it. These chimneys will NOT fit any of the four-prong burners. Those prongs are so tall they are restricted by the lowered bulge of these chimneys. 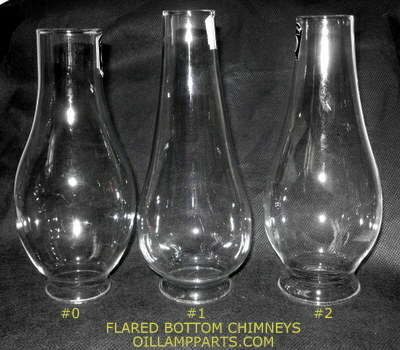 The flared-base chimneys have not been available for nearly 80 years. They have just become available again (11/27/12).